Vaccinations are not only safe and effective, they are an important and fundamental piece of your pet's preventive healthcare plan. Advances in veterinary immunology have made diseases that once were relatively common and fatal to pets easily preventable. There are also vaccines – such as for Rabies and Lyme disease – that help protect your family from dangerous and even deadly diseases. Additionally, with each passing year, veterinary science is improving on existent vaccines as well as increasing our ability to prevent an even wider array of contagious diseases. At Noank-Mystic Veterinary Hospital, we believe in protecting your pets with the safest, most effective vaccines available. We also believe that your pet's unique health status and lifestyle risks must be taken into account when making recommendations not only about which vaccines are appropriate, but also how frequently they need to be administered. At your pet's annual exam, we help you determine the level of risk that your pet faces and which diseases justify immunization. We believe that our balanced approach to vaccines is the best means to protect your pet from dangerous and deadly diseases as well as the risk of a reaction to a particular vaccine. Vaccines are administered to all puppies and kittens. Boosters start between 6 - 8 weeks and continue every two to four weeks until approximately 16 weeks old. Vaccines are then given yearly thereafter. Core vaccines that we administer for felines are Rabies and FVRCP. FeLV is administered for outdoor cats or those at risk of exposure. Core vaccines for dogs include Rabies, DA2PPC, Leptospirosis and Lyme. Non-core vaccines that we administer are Influenza and Bordetella (kennel cough). We strongly recommend these immunizations for dogs that are boarded or attending puppy or obedience classes. Core vaccines for ferrets include Rabies and Distemper. Reducing pain and promoting healing is one of our medical team’s top priorities. To that end, we have invested in a class IV Companion Therapy Laser, which we use on our patients following surgery or an injury and to help manage a range of chronic and acute conditions. Laser therapy is a painless FDA approved medical procedure that uses low-level lasers to stimulate the natural healing capabilities of the body’s cells. This form of laser therapy is effective at promoting healing on a cellular level as well as decreasing inflammation after surgery, injury or areas of the body affected by chronic illnesses such as arthritis or acute conditions such as otitis. It can also be used to increase joint mobility and relieve the aches and pains common to geriatric pets. During each treatment, the energy from the Companion laser inspires production of ATP in the cell. ATP is the fuel, or energy, cells need for repair and rejuvenation. This leads to an optimal healing environment where inflammation, swelling, muscle spasms, stiffness and pain are all reduced. In addition, laser therapy can accelerate tissue repair and cell growth, improve circulation and nerve function, reduce scar tissue formation, and help the immune system fend off infection. It causes no adverse effects on healthy cells. Your pet does not need to be sedated for laser therapy treatments and the experience is usually pleasant and comforting. Improvement is often seen after the first treatment; however, most pets require several treatments to achieve maximum benefits. The length and frequency of treatments varies with your pet’s condition. Our service is limited (but does include Fisher's Island). Please inquire about house calls. We have a state-of-the-art facility that is both a safe and welcoming place for you and your pet. However, we believe there are some situations and services that are best served by a friendly house-call. Quite simply, there are times when it is better to bring medical care to the pet than it is to require you to bring your pet to our facility. Certainly the most difficult, though important, house-call we make is when a beloved pet has reached his or her last day. Being at home, surrounded by familiar and loving faces with a trained professional helping to ease a sick or aged pet from this world, is an important aspect of veterinary care. Sometimes one of the frustrations of dealing with a sick pet is that you cannot simply ask what is wrong. When your pet is not well, you need to find out what the problem is. Dr. Otka and the medical team at Noank-Mystic Veterinary Hospital are trained and equipped to deal with all areas of internal medicine, including endocrinology (e.g. diabetes and related diseases), gastroenterology, dermatology, kidney and liver issues, cardiology, dentistry and more. 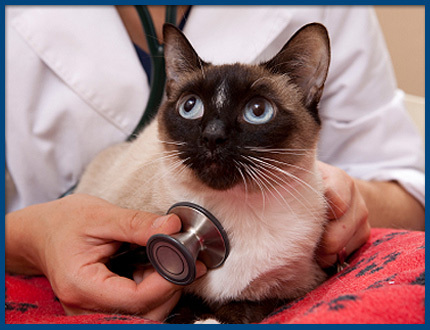 Along with our training and experience, we make use of the latest equipment to diagnose and treat your sick pet. For this reason, Noank-Mystic Veterinary Hospital has recently invested in the latest technology, including digital radiology and a comprehensive in-house laboratory. We also maintain close relationships with area specialists in order to provide greater treatment options for advanced or complicated cases. In all, we are confident in providing superior medical care and effective treatment plans in order to cure and manage your pet's medical problems. Behavior problems are the number one reason why owners give up a pet. Noank-Mystic Veterinary Hospital offers behavior counseling for pets that have issues including (but not limited to) inappropriate urination or defecation, aggression, separation anxiety, inappropriate chewing and barking, scratching, digging, and spraying (cats). Dr. Otka works closely with you to understand the source of these behavior issues and in developing a specific plan to help eliminate your pet's unwanted behavior. Sometimes, the behavior problem, such as inappropriate voiding, can be linked to a medical issue (cystitis, bladder stones, kidney disease, etc.) and can be treated medically. For other behavior issues, the treatment plan often involves behavior modification and may include medication-assisted training. If we cannot help with your pet's behavior problem, we can refer you to a board certified specialist in animal behavior. Our hospital is certified in stem cell therapy, which is used for the treatment of pain associated with osteoarthritis in dogs and cats. Stem cells have the unique ability to mature into cells with specialized functions. This makes them extremely valuable for repairing certain body tissues damaged by injury or disease. We use stem cells as an effective therapy for the treatment of arthritis. PennHIP is a multifaceted radiographic screening method for hip evaluations. The technique assesses the quality of the canine hip and quantitatively measures canine hip joint laxity. The PennHIP method of evaluation is the most accurate in its ability to predict the onset of osteoarthritis. 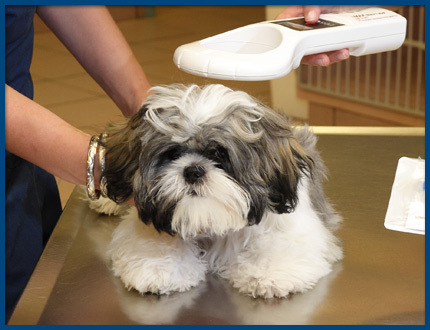 PennHIP is also a network of veterinarians who are trained to perform the PennHIP test. Radiographs are taken by certified PennHIP members and sent to the PennHIP Analysis Center for evaluation. The resulting data is stored in a database that is continually monitored as it expands. As more information becomes available, the PennHIP laboratory is able to obtain more precise answers to questions about the causes and treatments of hip dysplasia. To obtain diagnostic quality radiographs, the musculature around the hip joint must be completely relaxed. For the comfort and safety of the animal, this requires either heavy sedation or general anesthesia. The type of sedation/anesthesia is determined by the veterinarian performing the PennHIP procedure. After the radiographs are performed and developed, they are submitted to PennHIP for evaluation. The owner and the participating PennHIP veterinarian receive the dog's Hip Evaluation Report in the mail. This report contains the patient's distraction index (DI), which is the measure of passive hip laxity. The report also contains the dog's Hip Laxity Profile and the percentile group for his or her individual breed. Though somewhat involved, the report gives the pet owner and veterinarian information to accurately predict susceptibility to developing degenerative joint disease on dogs as young as sixteen weeks of age. PennHIP is a not-for-profit veterinary health service founded at the University of Pennsylvania. The diagnosis of cancer is stressful for pet owners, and the prospect of chemotherapy treatments can be equally difficult. However, the fear that animals will spend most of their last days sick from chemotherapy treatments is unwarranted. Noank-Mystic Veterinary Hospital provides chemotherapy treatments and helps you work through this difficult process. How would you find your lost pet if its tag becomes lost or unreadable, or if you are traveling? The sad fact is that getting lost is the number one cause of pet death. More than 10 million pets get lost each year and about 90 percent would not be returned to their owner unless they had some form of permanent lost pet identification. This is why we view microchips as a standard of care for all of our feline and canine patients. With a microchip, your pet can be identified quickly and easily by animal control officers, shelters or at veterinary hospitals. Microchips are safe, unalterable and permanent identification for pets and take only moments to implant. We use the HomeAgain microchip. This worldwide system offers customer service seven days per week, 24 hours per day and HomeAgain microchips can be read by any International Organization for Standardization (ISO) compliant scanner in the world. If you and your pet are traveling internationally, you're most likely going to need an International Health Certificate. To know what is required, Noank-Mystic Veterinary Hospital recommends contacting the visiting country's consulate or embassy. A helpful list can be found at: //www.state.gov/s/cpr/rls/fco. International Health Certificates are issued by USDA-accredited veterinarians only and must be endorsed by the state's USDA Veterinary Services office. The state veterinary services office oversees all export documents for pets departing from the US, and ensures that the veterinarians issuing the documents are accredited and have filled out the forms with accurate information. For additional questions concerning requirements for travel, please visit the US Department of Agriculture website at //www.aphis.usda.gov/travel/ for a complete list of travel regulations and alerts. You can also find a list of pet-friendly hotels at www.petswelcome.com. For difficult cases and/or surgeries, we refer our clients to Pieper-Olson Connecticut Valley Veterinary Associates located at 730 Randolph Rd Middletown, CT 06457. Other referral sources are utilized on a case-by-case basis (dermatology, ophthalmology, oncology, dentistry).